Cost to have wood shake roofing installed varies greatly by region (and even by zip code). Get free estimates from roofers in your city. Cost to have wood shake roofing installed varies greatly by region (and even by zip code). How much does it cost to have wood shake roofing installed? In a world of pros and cons there are very few cons and many pros to a wood shake roof. Although cedar wood shake roofing is more expensive and cost a little more to install than the modern asphalt shingles it makes sense to top your largest investment with the best. 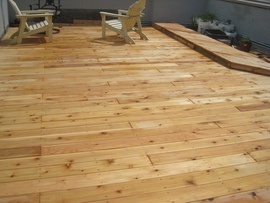 Wood shake roofing will last far longer than asphalt so in the long run you are saving money. Wood shakes have been around in the U.S. since the first colonies settled in New England because they will stand up to whatever Mother Nature dishes out. Most brands of shakes are treated to prevent moss, mold and mildew. They are also fire retardant. 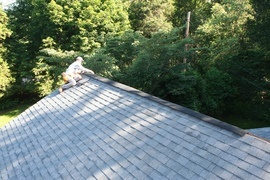 This wood roofing is also earth friendly if from a company who practices tree replacement. Hand-split: these have a more rustic split face exposed. Tapersawn: are sawn on both sides for a less textured appearance. The cost of a wood shake roof depends on the size of the home, how many layers of old roofing must be removed, the pitch of your roof (steeper pitches demand a higher labor cost) the type of shake-basic or top of the line; treated or untreated-climate and the cost of local labor. 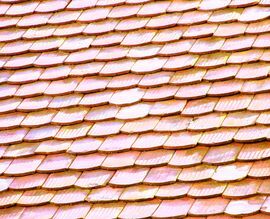 The roofing industry usually quotes materials by square feet or a 10 foot by 10 foot area called a "square." We are going to base our costs on the average American home size which is 40' by 60' - 24 squares or 2400 sq.ft. with an average pitch roof with only one layer of old roofing to tear off and dispose of and we are using 24" Heavy Hand-split fire retardant Western Red Cedar 1 Shakes 2. Wood shakes 2: Western Red Cedar 1 Shakes-Hand-Split Cedar Shakes 2/#1 Heavy 24"x3/4"/CCA Treated, and other materials cost $300 per square for a total of $7180. Tear-off and disposal: $80 per square x 24 = $1940. Labor: $150 per square x 24 = $3620 (According to RSMeans Contractor's Pricing Guide Residential Repair & Remodeling Costs 2015). Upgrades such as 24" straight split shakes 2 or other higher end shakes would take the materials cost to about $7320. Adding new flashing 3, vents, re-bricking of a chimney, new gutters, downpipes, fascia, soffit 4, exterior trims, ridge vent 5 snow guards that will prevent ice damming and turbine vents will all add to the cost; depending where you live it would add as much as $2140. According to RSMeans Contractor's Pricing Guide Residential Repair & Remodeling Costs 2015. Heat tape clips can be applied to the roof that de-ice the roof and make it easier for snow removal in the winter. On average, they cost $2 each installed. 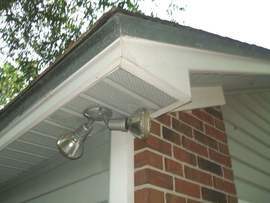 Water or rain diverters are small sheets of metal that are added to the roof over the doors or windows to prevent water from dumping in those areas. On average, these add another $50 per piece installed. 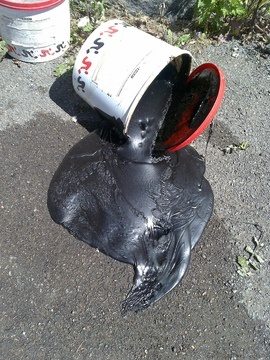 Roof sealant is a great option for preventing future leaks. This typically costs $850-$1000 for a standard roof. Underlayment 6 is a waterproofing membrane always recommended to prevent the ingress of moisture and other elements. It also provides weatherproofing until the roof is installed. This can be found at approximately $60 per square or more depending on its brand and quality. It is required depending on the type of roofing material and slope. Check local codes for requirements. A steeper roof would add to the number of squares. A very steep roof may bring it up to as many of 39 squares and the cost to install, for instance, up to $5890. They are the roofing of choice for rustic style homes, Arts & Crafts, New England styles and many period style homes like Dutch Colonel and Shingle 7. Wood roofing provides twice the insulation of asphalt 8 shingles 7 so they are also energy efficient. Shake 2 roofs require more maintenance than other types of roofs and typically don't last as long. Old shakes 2 can't be recycled or reused, so plan to have to replace at least some of your shakes 2 in the next five to 10 years. 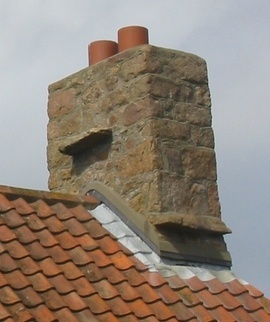 Roofs with more details, such as gutters and downspouts, chimneys, and vents, can cost more to install wood shakes 2. In most cases, plan to increase your labor costs by an extra day. If your home has a skylight, a roofer will have to apply special material and work around each skylight. Plan to add an extra $450 per skylight. 7 Shingle: A smooth, uniform, flat piece of construction material, available in a wide variety of materials and laid in a series of overlapping rows, used to cover the outside of roofs or walls to protect against weather damage and leaks. How much does it cost to have wood shake roofing installed in my city? Cost to have wood shake roofing installed varies greatly by region (and even by zip code). To get free estimates from local contractors, please indicate yours. Cost Considerations: In most parts of the country, western red cedar costs over three times as much as pressure-treated wood. On the west coast, it costs considerably less than in other areas. Ventilation opening in a sloped roof, installed at its pinnacle to remove moisture and warm air from the attic area. Cost Considerations: Ridge vent typically comes in 4 ft. sections. The typical home needs roughly 60 ft. at $10 per section, this adds up to about $150. This is the DIY price (without labor costs factored in). 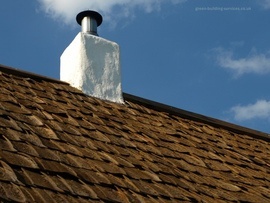 To have a 60 foot long ridge vent installed professionally, a roofing contractor will charge approximately $475 (including both labor and material).